As a fully paid up, card carrying member of the multi-monitor brigade, I should have been the one person on the team getting all gooey over the thought of six (six!) screens powered by one graphics card. I've been running a couple of screens from my home computer for the last few years, and for the most part loving it. The part that I haven't loved has been to do with running all those screens off AMD cards. You see where I'm going here? So yeah, AMD's multi-monitor implementation has been patchy at best, and downright obstructive at worst. Now it's managed to turn around the problems it created with its early multi-GPU, CrossFire setups though, turning its attention to the multi-monitor problems may be a smart move. So have they shorn up the age ol' problems, or are we still putting up with weak drivers and glitchy support? 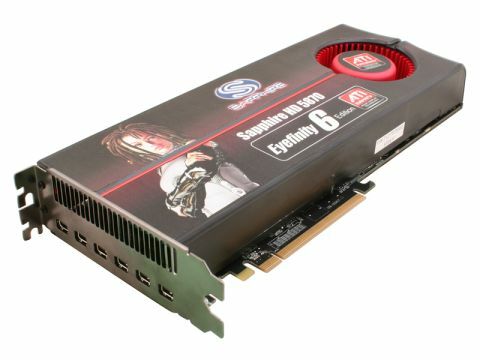 With the advent of the Evergreen/HD 5xxx series of graphics cards, AMD also introduced the ATI Eyefinity technology. This new tech allows up to six displays to be powered by a single card, though only recently have the cards been made available to allow you to hit those dizzying display heights. Up until now, the maximum we've been able to output to with a single 5 series GPU has been three; two via DVI/HDMI and a third activated by the DisplayPort connector. So finally DisplayPort has a use, then? With the HD 5870 Eyefinity 6 Edition, all the outputs are via DisplayPort, and of the mini variety so that it can fit all those sockets on the rather crowded backplate. Unfortunately, things don't get off to a great start, with driver worries right from the get-go. I say worries because we've just had an impressive update with the latest Catalyst 10.4 drivers, giving us a nice li'l performance boost for a minimal download. With the Eyefinity 6 Editions, though, you're going to have to revert to the 10.3 Beta drivers if you want to get those six screens of yours playing nice. Even with those beta drivers, things aren't too rosy. Admittedly, we managed to get the six panels outputting relatively quickly and all grouped up into one massive 5,040 x 2,100 desktop. There is, however, a problem with such a chunky desktop. I'm not talking about your face being burnt orange by the glow from those combined screens. I'm not talking about the fact that games characters will loom over you like giants. And I'm not even talking about the neck strain that sitting so close to a display like that on your desk will give you. No, I am of course talking about the bezels. With any multi-monitor setup, the bezels get in the way of anything you're trying to stretch across them. When you've got six arranged in two horizontal blocks of three, there's all of a sudden a whole lot more bezel to contend with. The lovely li'l Dell 22-inch screens we've got set up have fairly diminutive bezels on their own, but when side-byside that's doubled. Now AMD has considered this of course, so when you come to set up the grouping in the Catalyst Control Centre (CCC), it offers you the opportunity to correct the display for the bezels. This involves a fair amount of visual guesswork but, so long as your panels are lined up, does a decent job. Unfortunately, the correction means that it still renders whatever's blocked by the bezel, effectively making it look like you're looking at your desktop through a window frame. This is a nice effect in games, because it keeps everything relative. But with a six-screen setup, the centre of your view is inevitably obscured, right where important menu screens are. And here it's obscured by a nice shiny Dell logo exactly where your FPS crosshair ought to be, too. On the plain ol' Windows desktop it's a nightmare of lost icons and unreadable window pop-ups. Using a line of three screens grouped, then, is the best solution, offering an unfettered view directly in front of you and giving you more visual info in your periphery. But what to do with that other bank? Unfortunately, CCC is a bit finicky when it comes to extended desktops, but you can arrange to have three separate extended desktops (each allowing apps to be full screened) along the top. Sadly, there's no shortage of graphical artifacting accompanying this alternative arrangement. Just for giggles, we stuck three separate videos playing in fullscreen on each of the top monitors, only to have framerates in the movies stutter with ever more artifacting across all six panels. So, mostly useless then. And when you consider that you're paying out £1,700 on those screens and for the privilege of running beta drivers on your final release graphics card, it's a hard pill to swallow. But all is not lost. Sure, the Eyefinity 6 Edition is a bit of a white elephant that will only be of interest to folk wanting relatively inexpensive, ultra-high resolution displays in their exhibition space. But the three screen setup is where it's at and all HD 5xxx series cards can do that. Pick up any 2GB HD 5870, or spend another £100 on a HD 5970, pair that with three 24-inch panels in portrait and you've got a setup that will be far cheaper and far more useful than this one. But if money's no object, there's always the 4GB HD 5970 Toxic and accompanied by a tryptic of beautiful 30-inch panels in portrait, it would be the perfect arrangement. And it would also match the crazy-big res of the six-screen set. At best, the full ATI Eyefinity 6 setup is an arresting image; at worst it's an irrelevance. As a tech-demo, though, it's impressive; powering six screens with a single card is something AMD should be rightly congratulated for. It should have stayed in the demo room, because as a final product I struggle to see a relevant place for it. Eyefinity as a whole, is taking AMD's multi-monitor standard in a positive direction – although I remain distrustful of the CCC drivers.